Creomulsion is a strong yet gentle solution for calming the most persistent coughs. Active ingredient in the Creomulsion Formula, dexotro- methorphan, is the strongest cough suppressant available without prescription, and halts any urge to hack. Our original formula is as pure as it was in the 1920s, with no added alcohol, sweeteners, or artificial coloring. Creomulsion Cough Syrup contains safe and effective cough suppresant which acts by temporarily calming the cough control center to relieve coughs. Its rich, traditional base coats and soothes raw, irritated membranes. The active ingredient in the Creomulsion formula, dexotromethorphan, is the strongest cough suppresant available without prescription. the product contains no dyes, no alcohol, and no artificial sweeteners. Temporarily relieves cough due to minor throat and bronchial irritation as may occur with a cold. Works by coating the affected areas with a thick soothing base, designed to alleviate your cough at the basic level – the cough control center. 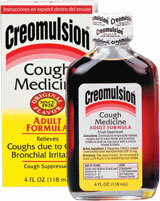 Since appearing on drugstore shelves in 1925, Creomulsion has been a tried and true family favorite to treat coughs. The medicine survived the Great Depression and of the brands that shared the shelves in the 1920s, only Creomulsion has stood the test of time. The formula’s longevity is a sure sign of its quality, and it is still the first solution families reach for when a cough strikes. Take the recommended dose every 4 hours. Do not take more than 6 doses in any 24 hour period. Use the enclosed dose cap. Do not use if you are now taking prescription monoamine oxidase inhibitor (MAOI) (certain drugs for depression, psychiatric, or emotional conditions, or Parkinson’s disease), or for 2 weeks after the MAOI drug. If you do not know if your prescription drug contains an MAOI, ask a doctor or a pharmacist before taking this product. Ask a doctor before use if you . . .
Stop use and ask a doctor if . . .
– Cough lasts more than 7 days, comes back, or is accompanied by fever, rash, or persistent headache. These could be signs of a serious condition. *Keep out of reach of children. In case of overdose, get medical help or contact a Poison Control Center right away.